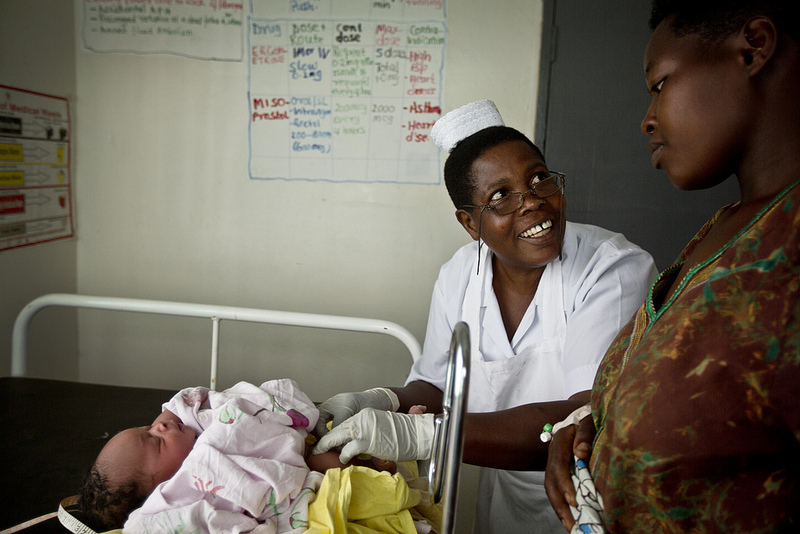 Grace Rutandaro, a midwife who has participated in emergency obstetric care training held by Jhpiego, discusses infant care with a mother as part of a GE Foundation–supported program to strengthen maternal and newborn health services in two districts in Uganda. Isingiro, Uganda—Immaculately dressed in her white uniform and boots, midwife Jane Ainembabazi paces the labor ward of Nyarubungo Health Center III, setting her work area in order by placing clean instruments and unused vials into their proper cabinets and discarding used surgical gloves and other items. She scans a colorful waste-segregation chart posted on the wall that serves as a guide. “Depending on the kind, waste is sorted in buckets of different colors—black for noninfectious, blue for mildly infectious, red for highly infectious and a placenta bucket,” explains Ainembabazi, the only midwife stationed at the facility that serves the Nyarubungo parish’s 5,000 residents. The different colored buckets signify the increasing threat level of the material and provide a road map to segregate, collect and dispose of medical waste. The color coding helps even the least skilled worker to both understand the risk level associated with each kind of waste and to properly destroy it. The key benefit of this system is that the likelihood of infection is significantly reduced as health workers of all levels at the facility actively engage in the waste management process. Routine infection prevention wasn’t always practiced at this health facility deep in Isingiro District, nestled among the vast hilly plains of western Uganda. In the past, the small staff—one midwife, two nurses and a clinical officer who doubles as the head of the facility—didn’t realize the impact such an organized and sanitary workplace would have on staff and clients alike. But in just four weeks, Jhpiego introduced a quality-of-care approach called Sort, Set-to-Order and Shine (referred to as 3S, an adaptation of the 5S approach promoted by the Japanese International Cooperation Agency) to the health center and 26 others in Isingiro District, which have become beacons of infection prevention and control. With generous support from the GE Foundation, Jhpiego taught health care providers throughout the district the basics of infection prevention and control as part of a comprehensive skills-building initiative to prevent the needless deaths of women and newborns. This project was undertaken in partnership with the Ministry of Health to strengthen health care services and help reduce maternal and newborn deaths. Medicines needed during childbirth are kept on a clean tray in a health facility participating in a quality improvement program supported by Jhpiego and the GE Foundation. At the start of the training, initial assessment reports from Nyarubungo Health Center III showed that, from January to July 2013, out of the 25 deliveries registered by the facility each month, one-third of the mothers returned because of sepsis. However, implementation of 3S and the training activities effected a drastic change: Nyarubungo delivered 20 babies in September and reported no cases of sepsis among their mothers. At the Mbaare Health Facility III, Binah Arinaitwe, the facility in-charge, acknowledges the transformation that has occurred since the GE-supported initiative began. “A neat and clean workplace boosts the liveliness of health workers, shows respect for clients, promotes the safety of both workers and clients, and improves productivity and effectiveness,” she says. The 3S training is implemented together with Standards-Based Management and Recognition (SBM-R®), a quality assurance approach pioneered by Jhpiego. SBM-R is a practical management tool for improving the performance and quality of health services. It engages health care providers to collectively identify problem areas, set standards for quality health care, and develop and implement action plans to strengthen systems. The 3S approach advances the concept of effectively maintaining a workplace through a systematic “housecleaning” at least once every three months. Health workers sort essential supplies from unneeded items and discard the latter; categorize essential items—such as reusable instruments and unused vials—for easy retrieval; and maintain a system for optimal use of all materials, supplies and equipment. The Set-to-Order step not only focuses on having visual order and safety but also on setting up a system where every essential item at the health facility can be returned to its proper place. Such procedures can help make the difference in saving a life. Nyarubungo’s Ainembabazi recalls a case that recently occurred in which the 3S approach proved invaluable. A woman gave birth to a baby who was not breathing, she says. The newborn resuscitation kit had been placed “within arm’s reach of the delivery bed”—in accordance with the training, international standards and 3S guidelines. The health care provider on duty quickly retrieved the kit and gently, meticulously initiated the resuscitation procedure. The baby responded and began breathing naturally within four minutes. 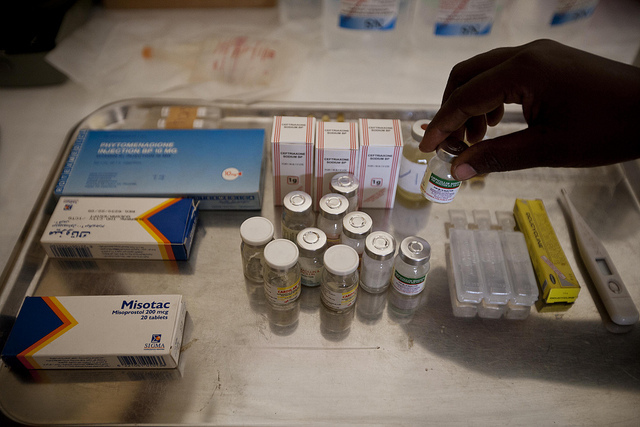 Standing in the health center, Ainembabazi opens cabinets labeled “delivery kit” and “drugs” and checks the supplies and items such as antibiotics and pain relievers. Her emergency tray, conveniently located nearby, contains lifesaving medications such as magnesium sulfate and oxytocin, keeping them readily available and accessible to help a pregnant woman during labor. “After the skills workshops, I’m now able to organize our labor ward better. My work is more pleasant because of the ease of how I get things done. During deliveries, each one of us knows where to place instruments after any procedure and also have them cleaned thoroughly,” says Ainembabazi. “There is no need to get confused about where to find things; the labels are clear so that one can quickly find what is required,” which, Ainembabazi adds, is especially important when a complication arises and lives are at stake.